18 year old shinny black gelding, registered “ Rocky Mountain Horse “, 1200 pounds, 15 hands and 2” with a medium build. WHAT I LIKE ABOUT ZEKE: He has an “I want to please attitude “and his gait is as smooth as it gets. I have to admit that I’m partial to shinny black horses that move as Zeke does. We purchased Zeke as a two year old form our relatives in Kentucky. Zeke is a half brother to Ben, same sire but different dams. Born on the same farm within 10 days of one another they have been together all their lives. Read the information on Ben for a little more back ground on the Rocky Mountain Horse bloodline. 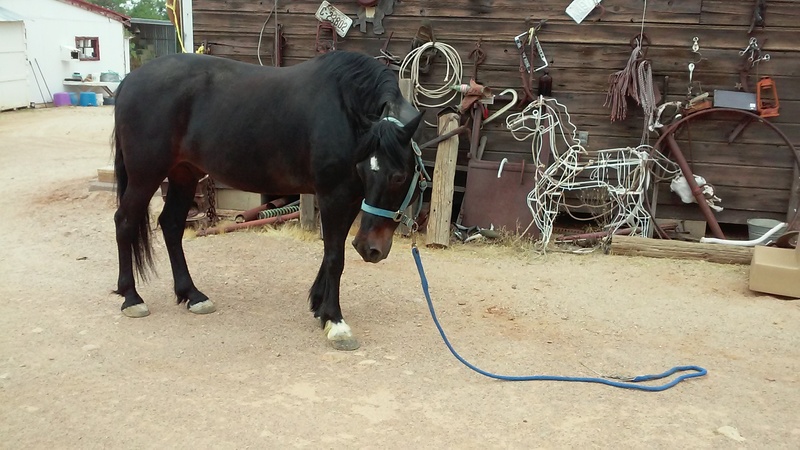 Zeke’s first couple years in Arizona were spent as a guide horse and a carriage horse. We drove Zeke as a single in the carriage as well as part of a pair with one of Ben’s full brothers who was also a shiny black horse. What a beautiful pair they were! Zeke transitioned easily into rental string because of his temperament and willingness to please attitude. He was a great asset to our business because he was always healthy, strong, and never soured of doing his job. I must admit that if we had a rider who was at the weight limit or perhaps a little over, it was usually Zeke who got the call to carry the load with no complaints. I admit that sometimes I felt sorry for him, oops, let’s not go there. Zeke was on the traveling team so any off property rides we did, Zeke was always along. Zeke will stand quietly for his rider to mount and will move off sharply with no hesitation on command. He is easy to clip, saddle, bridle, bathe and stands nice for the farrier. He has been exposed to all the typical things you encounter on a trail ride and has no faults or bad habits. He can carry the intermediate run-walking gait of the Mountain Horse for miles and is a pleasure to be around. 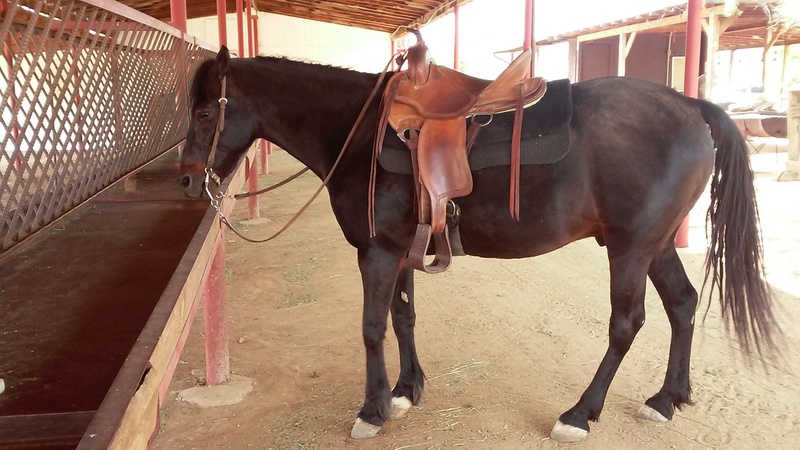 Zeke will make a great pleasure horse for someone who wants to enjoy the desert trails on a smooth even tempered horse. Zeke’s gait, attitude, and temperament are fixed. He will be the same horse today, tomorrow and next month when you return from vacation. He is the kind of horse you want to be around. Come see for yourself.